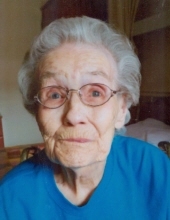 Edna Gray Singleton, 97, Mount Olive area resident, went to her heavenly home Tuesday night, April 2, while being cared for at Genesis Healthcare Center. Daughter of the late Emmett and Betsy Burroughs Gray, she was the oldest and the last survivor of their five children. Her life was not always an easy one, for when she was eleven, her mother died, and she quickly assumed the role of being "mother" to her younger siblings and performed housekeeping duties. She enjoyed working in the yard and garden, "putting up" vegetables by means of canning and freezing, and she loved to read. Of utmost joy to her was being with her family. As a member of Fellowship Baptist Church, she loved worshiping her Lord as long as she was able and until her mind faded. She is survived by four children and their spouses, Thurman Lee Doreauk of Concord, Brenda S. and Jerry Thompson of Grantham, Bobby Ray and Debbie Singleton, and Becky S. and Stanley Kelly, all of Mount Olive; 12 grandchildren; 19 great-grandchildren; and six great-grandchildren--what a legacy of love, joy, and devotion she leaves behind! Another son, James Mickey Singleton, Sr. and a grandson, preceded her in death. Funeral services will be Friday, April 5, at 2 p.m. at Tyndall Funeral Home, officiated by her grandson, the Rev. Stanley Kelly Jr., and followed by entombment at Wayne Memorial Park. The family will have visitation at the funeral home during the hour before the service, and at other times, friends and family may call at the home of Becky Kelly, 851 Norwood Ezzell Road in the Rones Chapel area, and at the home of Brenda Thompson, 659 Grantham School Road at Grantham. To send flowers or a remembrance gift to the family of Edna Gray Singleton, please visit our Tribute Store. "Email Address" would like to share the life celebration of Edna Gray Singleton. Click on the "link" to go to share a favorite memory or leave a condolence message for the family.